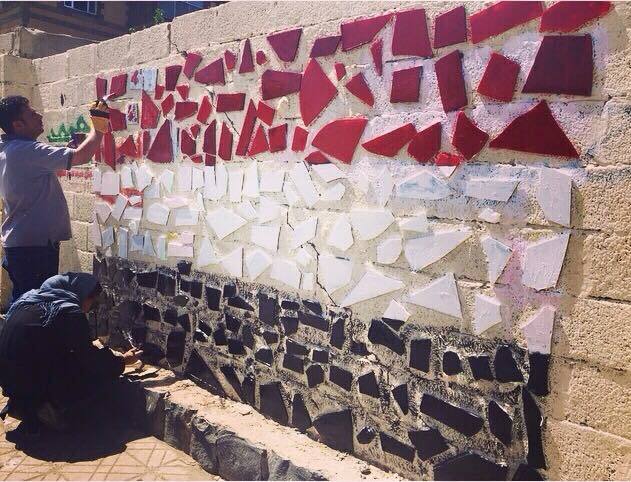 A mural in Sana'a of Yemen's flag using shattered glass of homes from a Saudi-led airstrike. Yemenis are putting their art and creativity to call for an end of a war in their country, which is the poorest in the Middle East. Over the past three decades, Yemen has suffered from chronic underdevelopment and a socio-economic crisis.The precarious humanitarian situation  was further exacerbated in the four years of political instability following the revolution in 2011, which ousted President Ali Abdullah Saleh. Since Saudi-led coalition forces started bombing the country on March 26, and ousted president Saleh's militia allied with the tribe the Houthis advancing and bombarding the southern provinces, the situation reached catastrophic levels . Thousands of Yemenis are stranded abroad, unable to return home. Another 300,000 are internally displaced in Yemen, with little to no help. The imposed embargo on Yemeni air, land and sea, caused Yemenis to be stranded overseas. With new visa requirements imposed on them by countries that previously welcomed them, and no resources to support them. Amid the airstrikes, tank bombardments and embargo, Yemenis are facing dire living conditions, with food, fuel and water shortages and continuous electricity black outs. Yet what Yemenis fear besides the death and destruction caused by the war is the social fabric that is being torn and the feelings of animosity that is developing between the different regions in Yemen, facing the same hardship. Yemeni artists used their creativity, despite all the difficulty and despair, to send out messages of cohesion, unity and call an end to the war and to the injustice faced by all. Each piece on the wall represents a home that was destroyed, a life that was lost, the wounds sustained, the pain and horror that the city lived on that day. The glass colored Yemeni flag stands for the solidarity and hope that must be revived in these moments of war and tragedy. The ‘flag’ can be seen in Hadda Street, a busy main road in central Sanaa. Ahmed Alshaiba , a Yemeni musician who lives in New York, produced his latest music video as a homage to Yemen and message to all Yemenis, entitled “My trip in Yemen”. Albasha takes us on a nostalgic musical tour, playing tunes on his magical Oud from different regions in Yemen, symbolising the feeling of unity during these hard times which the whole country is facing. Yemenis are losing hope in the possibilities of civil peace and social justice as they are surrounded by the color of injustice that only gets darker and darker each day. While it has always been more risky to hold a camera than to hold a weapon, it was still possible to continue filming. However, today it was worse than ever as we are stuck in a brutal war that left people drowning in hate and Yemen is being torn apart more and more. .In spite of the absence of transportation and continuous bombardment every day, young Yemeni women and men continued to come and help finish filming. Once again, Yemen's youth use their talent  to show the world their resilience demanding justice, unity and peace in Yemen…and soon.